From a photo by Aubrey M. Heupel of Fingerprince Prints Photography. This little frog (about 1.75 inches or 44 mm long) lives in acidic habitats in three distinct areas of the eastern US, with the largest population being in the New Jersey Pine Barrens. 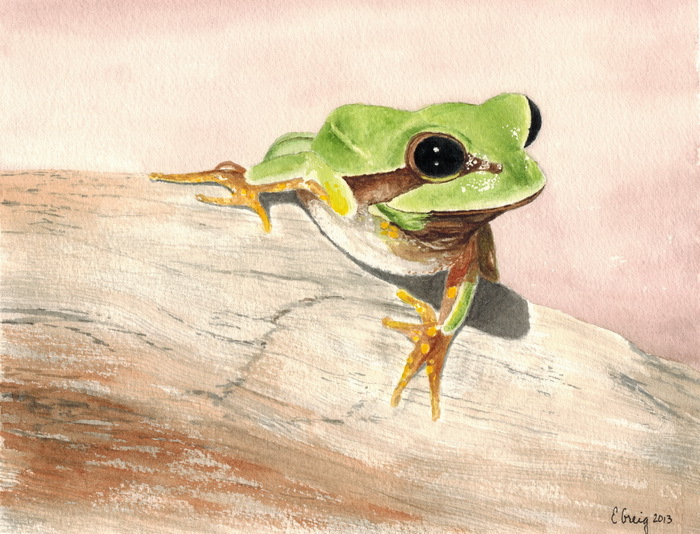 It’s classified as a threatened species by the state of New Jersey due to loss of habitat and pollution of breeding ponds, but its population is considered stable. Although they are considered pests in many areas, I enjoy watching Canada Geese flying in V-shaped formations. From a photo by melron49 in the WetCanvas Image Gallery. 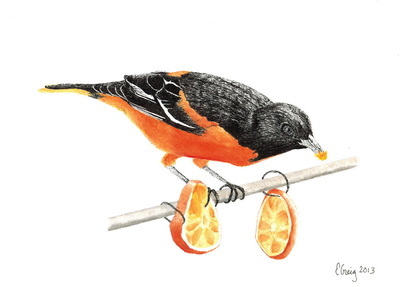 Baltimore Orioles are common in open deciduous woodlands throughout much of North America. You can attract them to your yard with slices of orange. Eastern Pondhawk is a common dragonfly of eastern North America. Males are blue, and females are green and black. 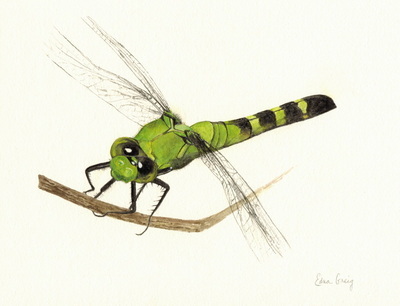 The name pondhawk comes from the fact that this species is a ferocious hunter often found near ponds. About the medium - Casein (pronounced kay'seen) is a water-based paint made from milk protein. It has been around for thousands of years but has waned in popularity since the introduction of acrylic paints in the 1950s. 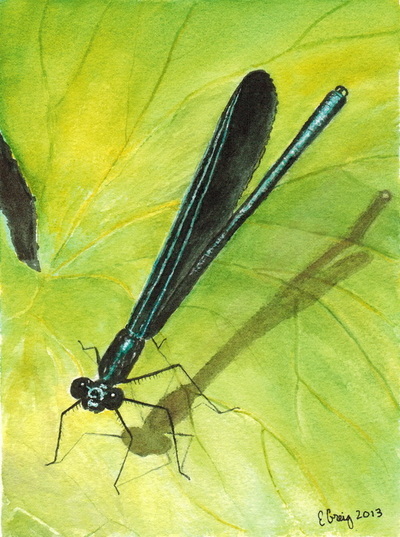 Ebony Jewelwings are common damselflies of eastern North America that have dark wings and iridescent blue or green bodies. They’re easy to spot as they flutter amid the vegetation near tranquil streams and ponds. Check my Eye on Nature blog post to learn more about Ebony Jewelwings. 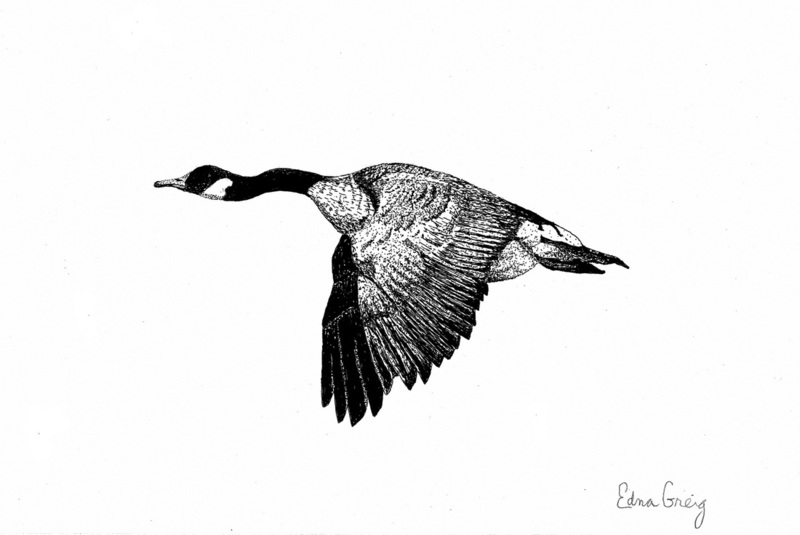 Copyright 2013-2014 Edna Greig. All rights reserved.